MAKE CERTAIN TO FOLLOW THIS PROCEDURE WHILE INSTALLING THE TRANSMISSION. The reasons behind shimming the clutch pivot ball are often misunderstood. Ultimately what you’re doing is correcting the offset geometry of the clutch fork so that it’s optimized for the clutch you are using. When it comes to aftermarket flywheels, clutch discs and pressure plates there tends to be some variance in the final offset distance of where the spring plate fingers are in relation to the throw-out bearing. This distance will also vary whenever the flywheel is resurfaced. If the machine shop had to take .030″ off your flywheel, your whole clutch assembly will now be .030″ further away from the transmission. This is when you need to shim the clutch fork pivot ball .030″ to compensate. When to shim the pivot ball? During the transmission install but first things first: Inspect your clutch fork for excessive wear. Inspect the clutch fork finger tips that push against the throw-out bearing. They should be round, without any flat spots. The clutch fork pivot ball socket should not show signs of wear. If it does, replace it. 1st gen owners take note: You can upgrade to the 2nd Gen clutch fork, part# MD770506. It’s much stronger than the 1st Gen fork and we have them in stock. Why shim the pivot ball? Because you want to keep the clutch fork at the optimum angle so that it sits in the proper location and doesn’t make contact with the transmission case when you push the clutch pedal down. If it does make contact you will risk breaking the transmission case where the slave cylinder bolts on. Another benefit of shimming the pivot ball is reduced thrust load on the throw-out bearing post. How to shim the pivot ball. Once the transmission is initially installed into the car and just bolted down flush to the engine, it is the time to check the position of the clutch fork. Checking it right this moment will save hours of hassle later!!! Take notice to where the clutch fork protrudes out through the square boot on the front side of the bell housing. Push the clutch fork over towards the passenger side so that the throw-out bearing is just touching the spring plate fingers of clutch. 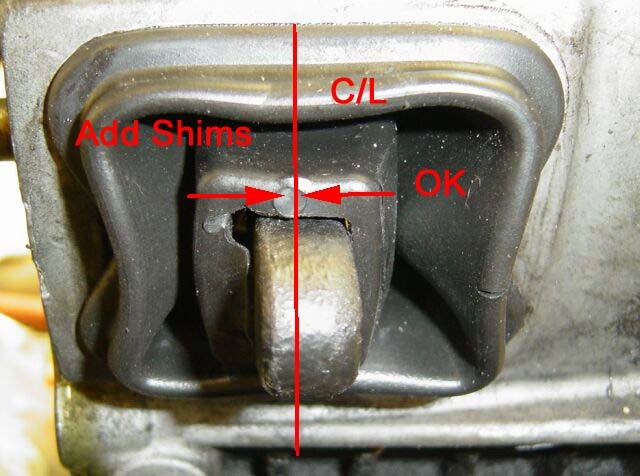 The clutch fork should be either in the center of the square hole or preferably just towards the slave cylinder. The photo below shows the clutch fork that needs a shim washer installed under the pivot ball. If the arm is sitting off center, away from the slave cylinder you need to pull the transmission back out and add a washer possibly two. This will get things back in line. Do not add too many washers or the clutch fork will make contact with the pressure plate and potentially cause other troubles, such as breaking the throw-out bearing post off the transmission case. If you are fighting clutch adjustment problems on an existing clutch install, get under the car and check this out and don’t be tempted into trying a lengthened clutch slave cylinder rod. The only way to properly correct the clutch offset geometry is by shimming the pivot ball. By properly shimming the pivot ball your clutch will work much better and your transmission will reward you with better shifts.